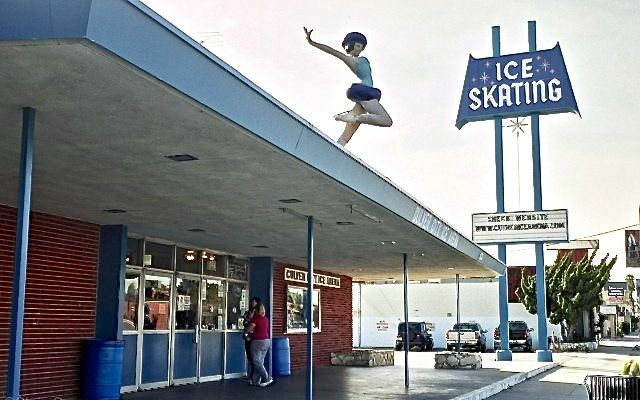 CULVER CITY, CA — In a surprise move, on July 28, the City Council of the City of Culver City unanimously declared the Culver City Ice Arena to be a City Cultural Resource at the “Significant” level. Its association with ice skating, both for recreation and as organized and professional sports in the form of figure skating and hockey, providing a place to support and cultivate local interest and talent, including individuals who became national and Olympic champions. The Council could have voted for City Cultural Resource status at the lower “Recognized” level, which offers no protections whatsoever, or they could have refused to declare it as a City Cultural Resource altogether. Although the City Council’s declaration gives rink supporters more leverage towards development of the property into a state-of-the-art rink, Council members warned that their decision does not directly affect the future of the property, in terms of what it might become once a new lessee comes forward. “It may not save the rink, but it will save the memory,” said Council member and Vice Mayor Michael O’Leary. Trotoux started off the proceedings with a detailed presentation of ARG’s findings, based on their extensive report (which you can read here: “Culver City Ice Arena Historic Resource Evaluation”), which was followed by public comments. Culver City resident Lindsay Carlson noted that despite the fact that the Culver City Ice Arena was established in the early 1960’s when racism was often blatant and easily visible, the Culver rink was an exception. As stated in ARG’s report, African American figure skater Mabel Fairbanks, a highly-skilled skater who was barred from Olympic trials during the 1930’s due to discrimination, taught at the Culver rink, and 1954 national champion, Catherine Machado, a Latina, skated there. Others bemoaned the loss of another Culver City landmark. Although the City Council vote was unanimous, three Council members, Jim Clarke, Jeffrey Cooper and Andrew Weissman, appeared to oppose the potential declaration going into their July 28 meeting. Clarke noted that the landmark “Ice Skating” sign was culturally and historically significant, but strongly implied that the rest of the property was not. He went on to ask if the sign could be moved elsewhere and still be considered significant. Trotoux replied that the location is a critical factor to the cultural designation. Cooper expressed concern that the designation would thwart future efforts to bring an ice rink back to the property. Cooper went on to suggest that some sort of exhibit about the Culver rink at whatever the property might become could be sufficient. Trotoux stated emphatically that an exhibit would not keep the Culver rink in the community’s memory. But before he could finish his question, Trotoux cut him off. Clarke stated that he was “ambivalent” about the potential declaration. Clarke also agreed with Cooper that City Cultural Resource status would be a road block to building an ice rink at the location. But he added that the property was not likely to become a new ice rink, anyway. In her remarks, Sahli-Wells pilfered a rather infamous comment from Eric Garcetti, Mayor, City of Los Angeles. For the record, Sahli-Wells did not utter the expletive, as Garcetti did during his remarks at the Kings’ 2014 Stanley Cup Championship Celebration at Staples Center on June 16. “As stated in the report, it should be noted that a lack of architectural significance does not mean that the building itself is expendable,” he added. At that point, it appeared that there were only two votes to declare the rink a City Cultural Resource. Weissman was the final Council member to speak and he said nothing to change that, at least, not at first. But then, Weissman’s remarks took a 180 degree turn. Shortly thereafter, the Council voted unanimously to adopt the motion. It appears likely that Clarke and Cooper voted in favor of the designation after seeing that the motion had the votes needed to pass so they could avoid being on record as opposing it. Shannon Takahashi, a long-time, now former employee of the Culver City Ice Arena who is one of the leaders of the campaign to save the rink, was overjoyed at the outcome, but flabbergasted, at the same time. Takahashi stressed the value of the Culver rink to the city. “It helps because if it looks like an ice rink and it says ‘ice skating’ on the sign, yes you can change the purpose of it, but it obviously means a lot to the city and why not take offers that are good that want to keep it a rink and keep it going,” added Takahashi.